Many of the 1600+ Exchange Traded Products (ETPs) on the market are low volume, low asset offerings that either implement failed strategies or have bigger, higher volume competitors. However, some low volume ETPs offer unique opportunities you won’t want to wait for. Choosing an ETP—are there alternatives? Before you trade a low volume ETP you should search for alternatives. 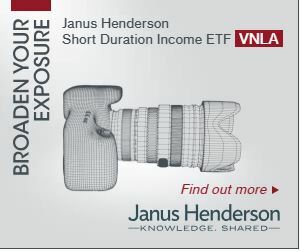 The biggest fund in a given strategy segment will usually have the narrowest bid / ask spreads and the best ability to handle large trades without shifting significantly in value. When comparing bid/ask spreads between ETPs it’s useful to convert them into percentages of the trading price (e.g., a 7 cent spread for a $25 ETP is 0.28%). Some people prefer Exchange Traded Funds (ETFs) over Exchange Traded Notes (ETN) for the equivalent strategy because the assets underlying the ETF are held directly by the fund. Whereas ETNs just give you a promise from the issuer to make good on redemptions, much like a bond, and you typically have no visibility into how the issuer is hedging their positions. Since ETN issuers are typically big banks with very good credit ratings I don’t put much weight in this distinction. See “Credit Risk and Exchange Traded Notes” for more detail on this subject. Two other possible selection criteria are the availability of options on the fund and tax considerations. Some funds require a K-1 form to be submitted for taxable accounts rather than the typical 1099 treatment. That’s usually not a big deal, but something to be aware of. Finally, fees are worth a look as a tie-breaker. However, if you’re interested in a low volume ETP you’re probably looking for gains that are large compared to the differences in fees. Once you’ve selected a low volume ETP you’re still not ready to trade. Some due diligence on the day-to-day price behavior of the fund is called for. There are three key factors: bid /ask spreads, intraday value, and market depth. The difference or spread between the price for you to sell (bid) and the price to buy (ask) for a low volume ETP is usually significantly more than the penny typical for high volume ETPs. If you have trouble remembering if it is the bid or the ask that is pertinent for your trade just use the price that’s worse for you—that rule always works. The spread is essentially another fee that you pay every time you go in and out of a fund; if the spread is wide its costs can be comparable to the annual fee. Monitor the spreads over the course of a couple days and at different times. Many low volume ETPs seem to need their morning cup of coffee before they reach their normal ranges, so give particular attention to the spreads soon after the market open. Some authors suggest avoiding trades right before close, but I’ve not seen that be a problem. Get a feel for the normal spread of the ETP— that will be important when you are ready to make a trade. The fund might not be working well, see If you think your ETP is broken for details. These factors aren’t necessarily show stoppers, but they warrant additional investigation. It’s also a good idea to check the market depth of the fund. You can do this by looking at the level 2 quotes. Not only can you see how many shares are being offered at the current NBBO (National Best Bid and Offer) but you can also see how much public liquidity there is at prices inferior to the current best bids and offers. This post gives more information on interpreting those quotes. Remember these quotes only report public liquidity— for ETPs, there are typically many more shares available near the bid / ask prices that are hidden from view. When you have decided to buy you need to make another decision—at what price? Never use a market order with low volume ETPs, always use a limit order—otherwise you’re just asking to be ripped off. With a limit order, you need to pick a price you are willing to pay and no more, otherwise no trade. You should only trade an ETP when it is behaving normally. Put your trade on hold if there’s an abnormally wide spread, unusual IV quote compared to the bid/ask or unusually slim market depth. If you’ve determined your ETP has good liquidity, and your order isn’t more than a few thousand shares you can be reasonably confident your order will complete at the current ask price. Market makers will often only officially commit a small number of shares (e.g., 100s) for the current best asking price so unless your order is small you will likely see a series of partial fills that might even stall for a while before your order completes. The initial action is very fast—clearly computer driven. When you’ve exhausted the immediate liquidity at the limit price and your order has not been completely filled you will often see a significant pause before any more transactions occur. I doubt there are any humans involved at this point, but experientially it feels like the other side is considering your order. Perhaps there are automated queries going to various dark pools soliciting interest—or maybe the computers are just letting you sweat. If your order doesn’t complete immediately you will see the ask price jump up, increasing the spread beyond its typical levels. You’ve sucked up the public liquidity displayed at the old ask price; you’re now seeing the new, higher price the market makers are asking for while they consider your order. The market will not hold still during this time. If it moves in your favor your order will complete, but Murphy would say that it will move against you. If it moves enough, your order won’t complete and you’re left with an incomplete order. This is not a disaster, you can replace your order (and pay another commission) with a new price that is more likely to complete. You’re probably still better off than if you had used a market order. If the market runs away from you when you’ve had a partial fill it’s very tempting to chase it, it’s very frustrating to be that close to a profitable purchase and miss out, but remember that markets fluctuate, and that it’s unlikely you’ve missed the last time the security will trade at that price. You can try to shave a few pennies off the ask price by offering a price between the bid and ask. If nothing happens you’ve lost nothing (unless the market moves against you), if you get a fill or a partial fill you’ve saved some money. If you order is large from a dollar amount standpoint you should get some help to move your order. It’s not a good idea for you to break up your order into smaller pieces in hopes of not significantly moving the price. High-frequency traders are very good at sniffing out attempts to do this. For specifics on getting professional help moving large orders see “How to Trade ETFs Without Getting Fleeced”. An abnormally narrow spread suggests that someone other than a market maker is trying to beat the spread, offering a trade inside the bid / ask. If you’re tempted to take this trade check the level 2 quotes to see if your order size is greater than or equal to the size of your trade. If your order size exceeds the listed liquidity you will likely experience a partial fill—not a big deal, but ultimately it might cost you some extra commissions. 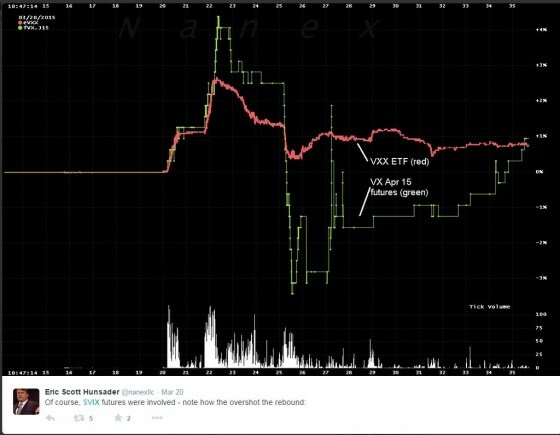 Unfortunately, low volume ETPs are very susceptible to flash crashes. One sloppy trader using a large market order can clean out the publically available liquidity in a few milliseconds, often dropping the bid price multiple percentage points. A market order is required to execute immediately so most hidden sources of liquidity can’t come into play. General market disruption, “fat finger” trades, and exchange software problems can also glitch ETP prices. These crashes often are over before a human can even get involved. The chart below shows how the VXX volatility ETN spiked from +4% to –3% over the course of 10 seconds. Because of flash crashes it’s a bad idea to have any sort of standing sell orders or trailing stops in place. A traditional stop loss order will convert into a market order as soon as the stop price is breached—automatically turning you into a sloppy trader. Stop loss limit orders are better because they put a lower limit on the price you will sell at, however, they will often execute on the recovery side of the flash crash, dumping you out of your position right before the security goes on to regain its pre-crash value. Eschew automated orders. Monitor things manually or setup email/text alerts to keep informed. The process for selling is very similar to buying. Make sure the ETP is trading normally with reasonable bid / ask prices located close to the IV price. As always with low volume securities limit orders are a must. Low volume ETPs can be very profitable but must be treated with care. I frequently see trades on these funds where the investors leave significant money on the table—or more accurately in the market maker’s pocket. Pay attention and don’t be a chump.